One UTSC staff member recalled how when she was a student here, there was no place to practise dance. So she and her friends danced in the halls. It was a bond they never lost, and decades later she is still in close touch with them. David Onley (BA’75; LLD’09), Ontario’s former lieutenant governor, didn’t talk about his storied career. He recalled his days at UTSC as a student with a disability, a campus politician and a hockey fan. Professors talked about students and students about professors. Cleaners and administrative assistants and people of widely diverse backgrounds all shared their candid recollections. They were participating in a student course project called Stories of UTSC: 1964-2014, part of a larger UTSC initiative known as the Scarborough Oral History Project, or SOHP. 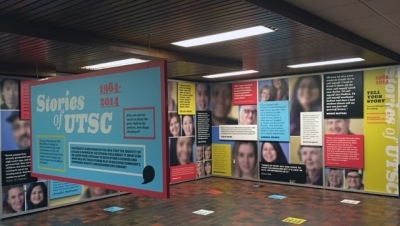 In late February Stories of UTSC came to life in a multimedia exhibit at the Meeting Place. People will be able to listen to parts of the conversations and see wall-mounted photos of participants and key quotes. Moreover, says Christine Berkowitz, Associate Professor, Teaching Stream, in History, anyone with an iPhone or iPad will be able to use a free app to instantly take a selfie and record their own story, then upload it to the collection. The Scarborough Oral History Project Digital Archive is also now available. Launched by the Department of Historical and Cultural Studies and the City Studies Program—which partnered to create the SOHP in 2013—as well as the Centre for Teaching and Learning, the project also received support from the Library’s Digital Scholarship Unit. The archive will initially contain the curated Stories of UTSC and will soon expand to encompass the growing collection of first-hand accounts of the lives of people in Scarborough gathered by students for the SOHP. The launch event and the summer courses that led to Stories of UTSC are supported by a $20,000 grant from UTSC’s 50th Anniversary Legacy Fund. Since its inception in 2013, the SOHP has been a cross-departmental initiative involving Christine Berkowitz and Connie Guberman from Department of Historical and Cultural Studies, and Ahmed Allahwala from the Department of Human Geography. Adon Irani from the Centre for Teaching and Learning joined the project as a partner in 2014 in his capacity as learning consultant. The four were co-applicants for the Stories of UTSC Legacy project. Like the UTSC stories, research for the Scarborough-wide project has been conducted by students in specially designed courses in Women’s and Gender Studies, History, City Studies, Sociology and other subjects. Working with community partners, interdisciplinary groups of students made digital audio recordings and took still photos of participants from all walks of life. The work will resume next fall. See more information about the project at storiesofutsc.ca.